This is one of those pivotal trips that we come back to and reminisce about often, even four decades later. It's not that it was the best trip ever. Rather, it is one that satisfied earlier ambitions and provided ground work for the treks to follow. I had just finished grad school at Stanford and was in need for a vacation. So Shon and I headed north with our boys. My brother Den had spent the summer working for the State Forestry for Washington and had a few days off before he had to head back to college. So we decided to do a fishing trip. Our destination was to be Spade Lake, a good sized body of water in a glacial trough on the side of Mt. Daniel in what is now the Alpine Lakes Wilderness. On our way in we passed Waptus Lake, a large alpine gem that is absolutely beautiful. The green formed a sharp contrast with the light colors of the Sierra that I had seen earlier that season. The major pass in this photo is one that I've always wanted to cross called Dutch Miller Gap. Even the name is alluring. Another view of Waptus Lake with Summit Chief in the background. Spade Lake with the ridges of Mt. Daniel in back. This meadow was our camp place while at Spade Lake. Some of the cutthroat trout we caught at Spade. This picture is something of a farce, for out trip occurred in mid September. As such, it had frozen a few times in the high country and there were no flies left. Hence, there was no fly fishing. So Den and I shared his spinning gear for the fish we caught. It was (and still is) the best mountain fishing I had ever encountered. Not all of the fish we caught were carried out. There is no better fish to eat than trout that are put into the pan while they are still twitching. Also, remember that this was 1965. There would be no fires allowed in this place today. Just before out hike out. This was my introduction to the Olympic Mountains of Washington. While I had read of them, I had not visited them. They were just too far away from home in the eastern part of the state for weekend trips. Then I moved to California and had no idea if I would ever get the chance. But in 1966 we moved back to the northwest bought a house in Puyallup, Wa. All of a sudden, the Olympics were in my back yard. I was working at Boeing, as was an old college friend, Parker Holden. Parker was headed out to meet three friends of his for some casual climbing in the Sawtooth Ridge area above Staircase in the SE part of the Park. I ended up tagging along on the trip, and that's about all it was. Parker picked me up after work on a Friday evening and we headed for the hills. One of us had something going on later in the weekend, so the plan was to walk into Flapjack Lakes that evening. We would meet some hot shot climbers that Parker had met through his neighbor in Olympia, a world famous international mountaineer. At that time one could drive to within about 4 miles of the lakes, so it should not have been a difficult trek from there. Wrong. The trail climbs immediately from that old trailhead and the trail is all but casual. The sun was setting as we left the car. Things became complicated when we were forced to hike with flashlights. We plodded along in the dark and finally got to the old shelter at the lakes sometime after midnight. We immediately threw our sleeping bags out, almost in the trail, and crashed. The next thing I remember was some guy poking me with an ice ax at 6 AM. He was saying that they had already been up for a while and wanted to get started. Parker and I got up, grabbed something to eat, jumped into our boots, and we all headed up the trail. The base of the ridge was up above the lakes by over a thousand feet. It was soon apparent that (1) I could not keep up with these hot shots and (2) they were not interested in slowing down to accommodate me. That was as it should be, for this was a casual weekend and they wanted to garner a few summits. (To normalize things for the readers, one of these guys had just come off of a successful ascent of Mt. Sir Donald in the Canadian Rockies, a climb of over 4000 feet of continuos Class 3 and Class 4 rock.) I persuaded Parker to take off with the other guys to do a climb and that I would follow along, perhaps to get a photo of them from one of the lofty escarpments. They had decided that their first climb would be the Horn. I really had no problem with splitting from the group, although I was frustrated with my own lack of conditioning. I finally took a more leisurely pace and for the first time was able to notice the area around me. It was unbelievably lush. It was green everywhere. Even much of the rock was covered in moss. Wild flowers were found all over. The trail was often covered with plants growing in from each side. I eventually got up to the place for me to leave the trail and head up toward the peaks. I started navigating toward the Horn. I got up there and knew that they were already there and climbing, for I could hear the pounding as they put a piton or two in for belays of their climb. Eventually, I heard Parker shouting at me. I looked up to see several heads looking down at me from the summit of the Horn. Parker shouted for me to meet him, so I didn't head for camp just yet. Parker and the others on the summit of the Horn, as seen from way below. Parker came down and met me at the base of the Fin. In the mean time, his three friends headed off to climb Mt. Lincoln. Parker and I went over a pass on the north side of the Fin to the east face. We found an easy chimney on the north edge of this and climbed it for less than a rope length to a bomb proof belay stance. I then belayed Parker while he climbed up and to the right, around the corner onto the west face. He eventually came to the end of the rope. I could then hear some pounding as he was putting a piton in. Once he was in a secure position, he belayed me out to join him. The rock was good and the climbing was not difficult, which was a good thing, for we were now above a wicked overhang. Once I got to Parker, we traded places and he continued climbing to the summit ridge and the top. Our route sounds similar to Route 4 in the 1972 issue of the Climber's Guide to the Olympic Mountains, except that the route we climbed was nothing like the Class 5.2 variation listed there. Our route was Class 3 or 4, but no more. Parker sits on top of the Fin. After Parker belayed me up and we enjoyed the views, we climbed and rappelled down the easy east face. We saw the other guys on Lincoln, as I recall. This trip was a real gem for me, even though it also had moments of disappointment. It provided a glimpse of what was in the back country. It was clear that the country went on and on, but the roads did not. This was a Wilderness park. We moved to Oregon in just a couple of years, but got to Washington often. This allowed me to start a quest to see more of it. That has continued through my kids. My older son, Ron, by now has over 1000 miles of trail travel on his logs for the Olympics. I've got about 750 and Roger probably has a few hundred. And that is not counting the grand kids, one of whom has done both the Skyline and the Bailey Range. With Olympus in the distance, this is the trip that got it started. Spray Park, Mt. 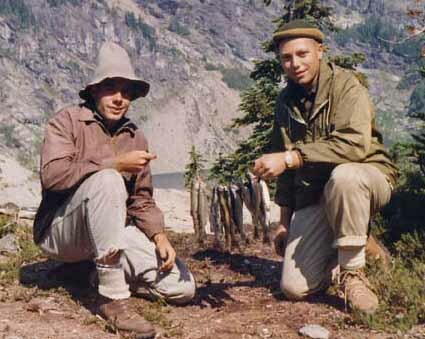 Rainier National Park, 1966. I didn't really get out a lot in 1966, for we had just moved to a new house and were busy with a new yard and generally a new life style. Still, it was a good year with a couple of seminal trips. One was described above. The other was a quick over night to Mt. Rainier. Living in a house in Puyallup kept "The Mountain" in our face all the time. The attraction was hard to avoid. Labor Day arrived and I realized that I had not been into the hills except for that brief hike in the Olympics. We had plans for a family picnic on Labor Day itself, and I had lawn chores on Saturday. So I decided to do a quick junket to the Mowich Lake entrance to the park and to hike in to Spray Park. Mowich is off the beaten track compared to other entrances, for there is only a dirt road to get there. There are hiking trail heads, but no restaurants or paved "paths" or other things for the tourist. So it is not crowded, at least by Rainier standards. I didn't have any plan other than to go up and camp. It was another first for me. I had never been out alone before, at least for an overnight. While solo travelers are relatively common these days, they were not in 1966. I left Puyallup at about mid day on Sunday and got up to Mowich Lake a few hours later. I started hiking and was soon getting some views. That first view of the mountain on the Spray Park trail. Next came Spray falls, a Rainier classic view. Before long I was into the meadows, about 5 miles from the trailhead. The sun is still high in the west, but it won't last a lot longer. Wanting to prolong the sunset, I thought it would be fun to camp up high, so I headed for Hessing Rock, which is on the edge of Spray Park. I eventually reached a flat rocky area on the edge of Hessing where I dropped my pack and started taking some pictures while I still had some light. There was still Alpineglow, but the meadows below were becoming dark. This corner of the mountain is know as the Mowich face and the dominant ice on the right is the Puyallup Glacier. The sun was soon to vanish from my location. It was starting to get cool, so I crawled into my sleeping bag. As it became really dark in the meadows below, I heard some campers hollering at a bear to drive it out of camp. It must not have worked, for they were later beating pans. I woke at first light to see the top of the mountain catching those early rays. The view to the north was also outstanding. Trips to Rainier National Park have, of course, continued. However, they have largely taken a back seat to the Olympics. The major reason for this was my fascination over the remoteness of the Olympics. The management policies in Rainier have also seemed somewhat more autocratic. Perhaps that was necessary for a park so close to a fast growing population center.